Airstream Innovations is a clean technology innovator, and the creator of the world's first wind-assisted, air-supported structure. These structures create optimal airflow conditions for many applications including, but not limited to agricultural, sports, and industrial operations. Airstream’s natural grass fields grown in their patented positive pressure structures can be installed for as little as half the price of conventional ‘bubble houses’ of the same scale. When you consider this doesn’t include the cost of a plastic turf field necessary in these air-locked structures, sports organizations that prefer playing on grass now have an affordable and far more appealing alternative. In other words, you can now have a protected playing field, including natural grass, for nearly half the cost of current alternatives. Rob Brokaw of avocado fame is at the helm of this multi-generational farming family. 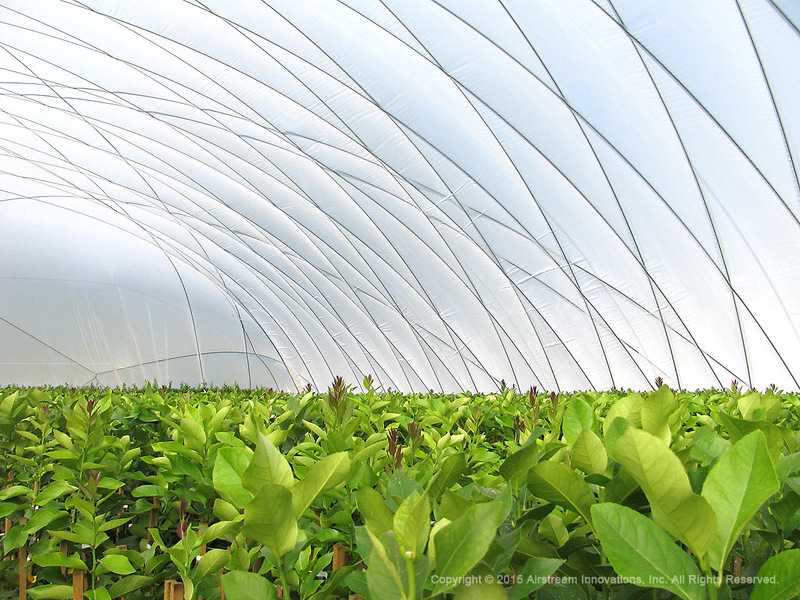 To ensure their presence in the citrus market in the face of new HLB quarantines, Brokaw ordered three Airstream tunnels, each 100 ‘ x 500’ featuring a triple-tower configuration and nearly 50,000 square feet of planting space each. Brokaw recognized he needed a reliable solution and chose Airstream Innovations to help protect their future citrus business. The first tunnel went up in July 2013 with the 2nd and 3rd tunnel over the ensuing six months. Due to the favorable climate of Ventura County, Airstream ‘s technology and Brokaw’ s operational experience the citrus tree production in these houses never cease. “Airstream’s technology has met our requirements and exceeded expectations” . Brokaw currently produces over 250,000 plants per year and through the years has sold more than 10 million trees to California orchard growers. Brokaw also exports to over 45 countries worldwide. Brokaw is proud of the work they do and visitors are always welcome. Young ‘s Nursery has supplied California’ s commercial growers since 1954. Relying on an established track record in the citrus industry, Young ‘s has fully embraced Airstream’ s technology, becoming one of Airstream ‘s larger scale citrus nurseries with over 10 acres in production. The photo above shows the first two of 20 houses with a third in process. Below is house number #1 fully planted out within just a few days of inflation. An automated misting system was installed to mitigate the excess heat, however the geometry of the structure coupled with the natural evaporation of the plants produces a thriving growing environment even in extreme heat conditions that precluded its use. One of Airstream Innovation’ s key strengths is airflow and the ability to automate it for any crop. Young ‘s third greenhouse, featured below, shows the “bones” of the operation prior to attaching and inflating the cover. The bones being a skirt buried around the perimeter and two intake towers with downward-facing electric fans. Airstream’ s patented wind-assisted structures include a pest protection system unparalleled in the industry. Airstream Greenhouses provide immediate and open access to the facility. The access door is also the automated ventilation system. When Young ‘s Nursery is fully built out, they will have nearly one-half million square feet of USDA certified protected greenhouses in year round production. For tours, contact Airstream Innovations. Learn more about Young’ s Nursery. 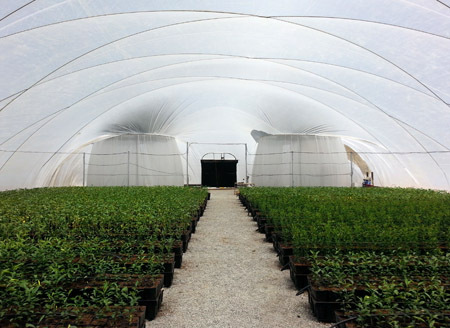 Our fully screened, positive pressure greenhouse structures provide optimal growing conditions while protecting from insects and reducing water usage, all at a fraction of the cost of traditional framed greenhouse structures. Our structures provide freshwater and saltwater aquaculture operations with ideal conditions, optimizing gas exchange and preventing freshwater intrusion into saltwater systems. Great for aquaponics, algae production, shellfish/pearl production, and aquaculture! From the outside, it looks like a crash-landed blimp. On the inside, it feels like a wind tunnel. For inventor David Chelf, this strange structure -- a high-tech greenhouse with no skeleton, whose lightweight skin is held aloft on breezes from giant fans -- looks like the future of agriculture.